Add a touch of class to your bedroom with the Palermo Stool. The Palermo Stool is the perfect addition to any glamourous bedroom and the ideal partner to the Palermo 4 Drawer Dressing Table from the Palermo range. 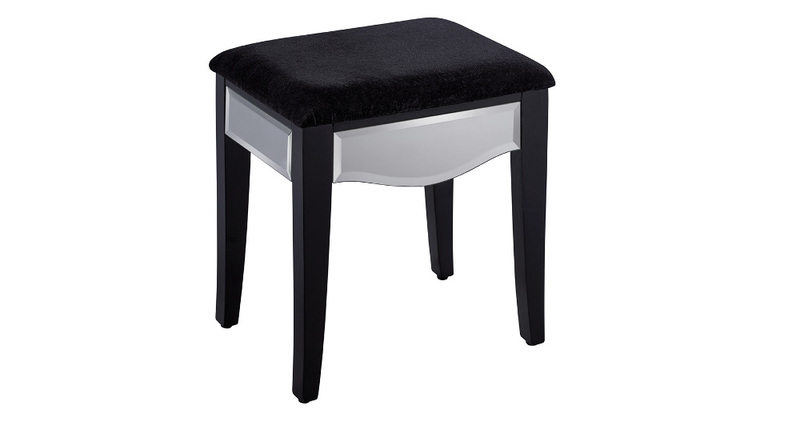 The stool has a soft padded seat, stunning tapered legs and mirrored finish detailing with bevelled edges. It's a stunning piece of furniture that is comfortable and beautiful. The Palermo Stool is built to last. The strength of the stool comes from the quality MDF frame and sturdy tapered legs. The framework is enhanced with the addition of the bevelled edged mirror finish. 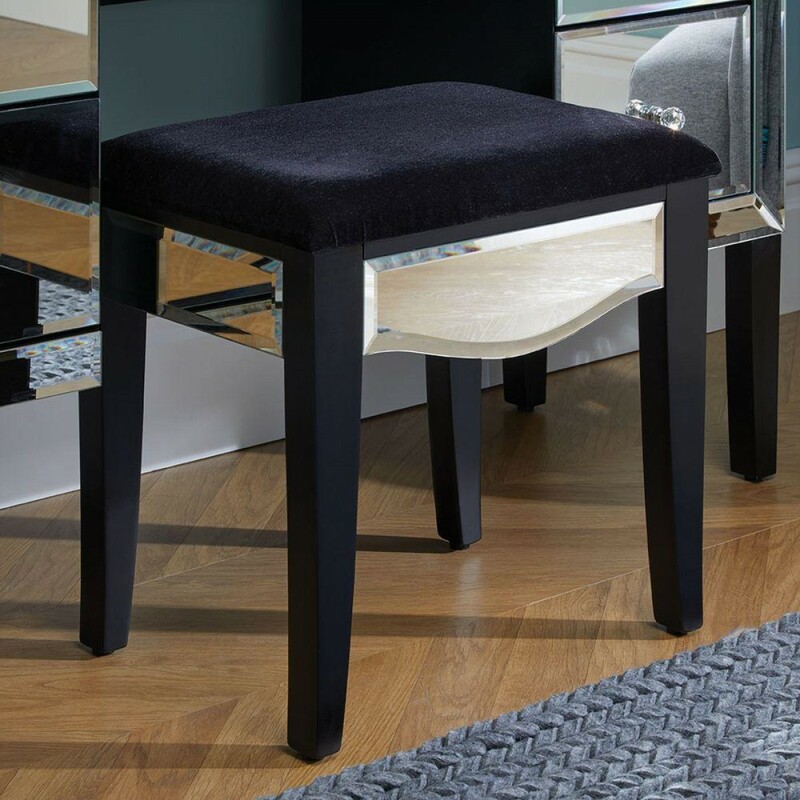 The mirror finish makes a statement, upscaling a simple stool to an elegant piece of furniture fit for a boudoir bedroom or a high-quality boutique hotel. The stool is padded, providing a comfortable place to sit and start/end your day. Transform your bedroom with the Palermo Stool. The design is elegant and romantic, creating a relaxed and glamourous space. The Palermo Stool arrives readymade, no construction is necessary. Start using the stool immediately and add an extra piece of practical furniture to your bedroom. You can use the Palermo Stool as the perfect perch alongside the Palermo Mirrored 4 Drawer Dressing Table - or it also works as a standalone piece. 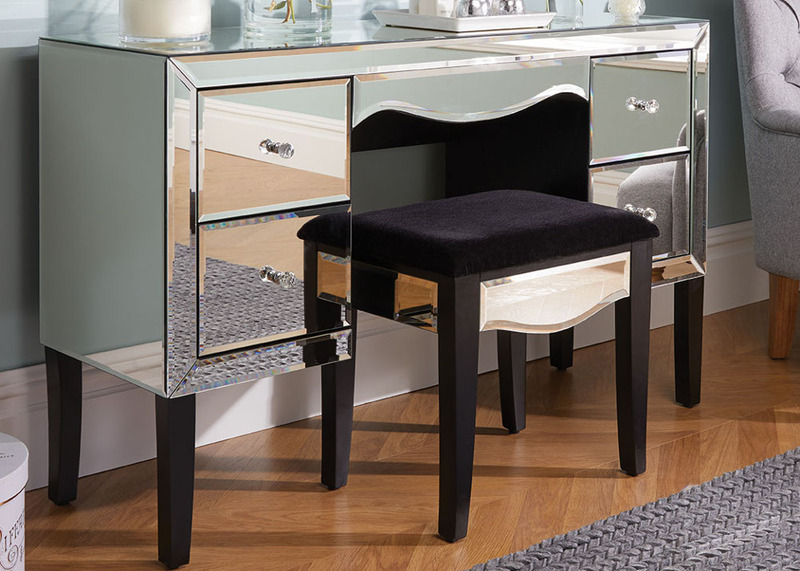 The Palermo Stool is one of the elegant pieces of bedroom furniture from the Palermo Mirrored Bedroom Furniture Collection.There are several essential items that complete the bedroom, resulting in plenty of extra storage space and a romantic and glamourous place to relax. The Palermo Stool is the perfect finishing touch for any bedroom!